The Intercontinental Title is currently around Bobby Lashley’s waist. However, Finn Balor is gunning for that championship and he could be feuding with The All Mighty for a while. WWE needs to make plans following WrestleMania and hype upcoming events. Therefore, certain matches are advertised ahead of time to draw interest. 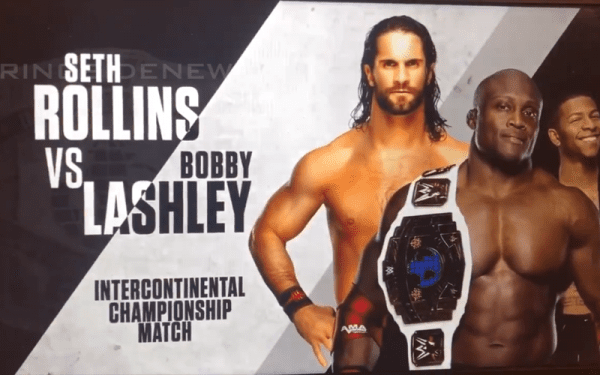 On April 15th, on the same day as the International Superstar Shake-Up, WWE is advertising an Intercontinental Title match between Bobby Lashley and Seth Rollins. This is very interesting because one week prior to that show Rollins will attempt to beat Brock Lesnar for the WWE Universal Championship. Bobby Lashley will also likely defend his title a couple of times before then as well. Only time will tell if WWE delivers on this match, but this is what they are advertising. Of course, the card is always subject to change and WWE has found nothing wrong with flat-out lying to fans recently about who will be working an event.